Secured & instant digital delivery for Patreon creators. How to use E-junkie for Patreon digital delivery? If you aren't logged into Patreon, login to Patreon first. Once you are logged in. Go to the developer portal and click on My Webhooks on the left sidebar. 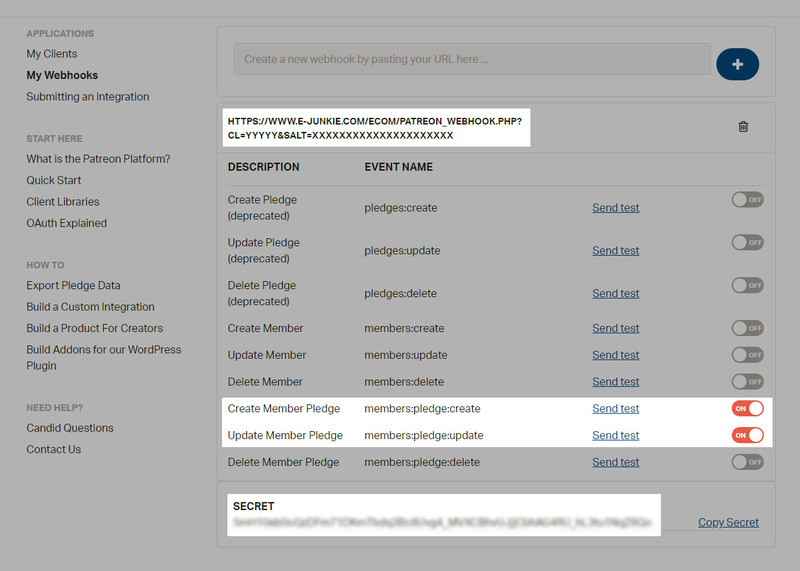 Once the webhook is created, enable Create Member Pledge, Update Member Pledge by toggling the switch on right side. Copy the SECRET automatically generated by Patreon and save it in E-junkie. Select the Products, you want to import and click Import. All the goals will be imported into your E-junkie accounts. Patreon pledge amount and E-junkie item price has no relation to Digital Delivery. Even if the Pledge amount and Item Price don't match, E-junkie will do digital delivery for the pledge.